The iridium 9555 Handheld Satellite phone is packed with new, innovative features such as improved SMS and email messaging capabilities and upgraded Mini-USB data port. The Iridium 9555 satellite phone is a rugged, compact, and easy to use satellite phone engineered to withstand the world's toughest environments, working anywhere in the planet with the most reliable, truly global network.. The Iridium 9555 is both smaller and lighter than previous Iridium phones such as Iridium 9505A, 9505 or 9500 models. This satellite phone is ideal for industrial or rugged conditions, yet appealing to professional travelers. You can use this satellite phone for business, adventure, or pleasure and stay in connection across seas and time zones, in remote locations and on the go. The Iridium 9555 Satellite Phone offers the best in native language support for global phone users. 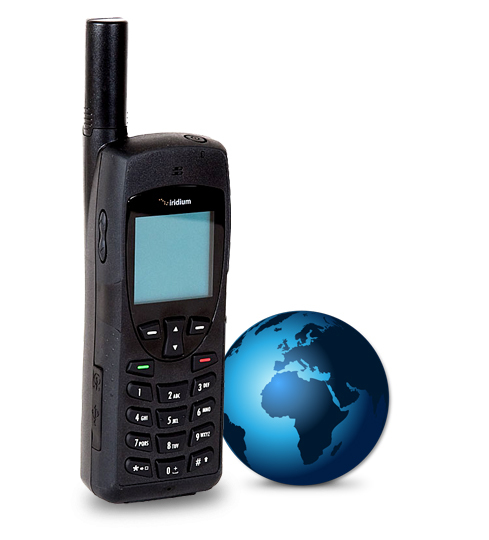 The 9555 is a powerful satellite phone with a significantly reduced footprint from previous iridium phone, more hand-friendly form factor, and aerodynamic features such as an internally stowed antenna, this sleek handset is designed to easily go wherever you go.Whether you are in Artic, desert, mountains, or a jungle the Iridium 9555 will keep you connected with the most reliable global communications network. The Iridium 9555 is engineered to withstand rugged environments, so customers can depend on it as a critical lifeline wherever need takes them. This phone provides the comfort that you can easily make a call even in the most extreme weather conditions and have a crystal clear connection. Iridium phones have proven to be rugged, durable, and 100% reliable. NorthernAxcess offers very competitive prices on airtime and if you purchase any Iridium satellite phone, we will waive the activation fee of the prepaid airtime. Buy an Iridium 9555 Satellite Phone plus Prepaid Airtime and Save Money. Do you have a 9505A, Motorola 9505, or Motorola 9500 iridium satellite phone and want to upgrade to the 9555 model, you can send us your old iridium satellite phone and will give you credit towards your new purchase. Learn more about the NorthernAxcess Buy Back Program. Click the button below to add the Iridium 9555 Satellite Phone - BPKT0801 to your wish list.